Authorities have identified the alleged gunman in the deadly shooting at a Wisconsin Sikh temple as Wade Michael Page, an Army veteran who may have ties to white supremacist groups. NBCNews.com's Pete Williams reports. Updated at 4:05 p.m. 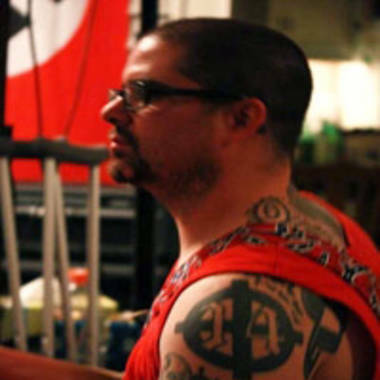 ET: The alleged gunman in Sunday’s deadly shooting at a Sikh temple in southern Wisconsin is Wade Michael Page, an Army veteran who may have ties to white supremacist groups, authorities announced on Monday. Page, who served in the Army from April 1992 through October 1998, allegedly killed six people at the temple and wounded four, including a police officer, before he was shot and killed by police. According to the Southern Poverty Law Center, Page is the former leader of a neo-Nazi music group called End Apathy. At a press conference, law-enforcement officials said Page was the only shooter. "All of us are heartbroken" by the shootings, President Barack Obama said Monday. He also ordered flags in public buildings be flown at half-staff until sunset on Friday. If it turns out, Obama said, that the gunman was motivated by the ethnicity of those at the temple, the American people would recoil against that type of attitude. Police say Page, 40, legally purchased the 9mm semi-automatic handgun used in the shooting within the past 10 days near his home. The gun was recovered at the scene at the attack. A police officer called to the scene shot Page dead before he could fire on more worshippers as they prepared for Sunday services at the temple in the suburb of Oak Creek, south of Milwaukee. Five men and one woman were killed. They were identified Monday as Sita Singh, 41; Ranjit Singh, 49; Satwant Singh Kaleka, 65; Prakash Singh, 39, Paramjit Kaur (female), 41; and Suveg Singh, 84. In addition to the wounded officer, three other people, whose names have not been released, were injured. Edwards said two of them were in critical condition at a hospital, and one was treated and released for a minor wound. At a news conference Monday, authorities said they have not determined a motive for the killings. "We are investigating it as a possible act of domestic terrorism," FBI Special Agent in Charge Teresa Carlson said. She defined domestic terrorism as "use of force or violence for social or political gain." Carlson said there is no reason to believe anyone else was involved in the shooting. She said, however, they were pursuing one "person of interest," an unidentified white man wearing a dark T-shirt and sunglasses whose photo she held up during the press conference. The FBI later said that the man in the picture had been located, interviewed and ruled out in connection the shooting. Edwards said police received the initial call about the attack at 10:25 a.m. Sunday, and officers arrived on scene within minutes. Among the first to arrive was Lt. Brian Murphy, who was ambushed when he stopped to help a victim. Murphy was shot eight to nine times with a handgun at close range, Edwards said at Monday's press conference. He was wearing a bullet-proof vest, but was hit in his extremities and suffered a serious wound in his neck. When other officers arrived to the scene, they saw the suspect walking and commanded him to drop his weapons, Edwards said. At that point, the suspect fired at police, hitting two vehicles. An officer returned fire with a squad rifle and took him down, according to Edwards. As officers went to check on Murphy, 51, who has been with the Oak Creek Police Department for 21 years, he waved them off, signaling they should go into the temple and help other victims. Following protocol, officers secured the exterior and helped Murphy, who was rushed to the hospital, before they went into the temple. Murphy remains in critical condition. NBC's John Yang reports from Oak Creek, Wisc., where a white, male Army veteran is the suspected gunman in a deadly shooting at a Sikh temple. U.S. Army officials say Page was first stationed at Fort Still, then Fort Bliss and then Fort Bragg. At Fort Bragg, he was assigned to psychological operations associated with a special operations unit, though was not a special ops trained soldier, officials told NBC News. Page rose to the rank of sergeant while in the Army, but was given a dishonorable discharge in 1998 and reduced in rank to a specialist for acts of misconduct. U.S. officials told NBC News the misconduct was connected to a drinking problem. Officials say Page had no criminal record in the military and no record of combat deployments. In an interview with The New York Times, Page’s stepmother, Laura Page, 67, of Denver said she had known him since he was a boy of 10. His mother, a dog groomer, died when Wade Page was 12 or 13, she said. He then went to live with an aunt and grandmother. His stepmother was shocked by the news of the shootings. “I can’t imagine, I can’t imagine what made him do this,” she told The Times. Authorities believe Wade Michael Page is the gunman who killed six people at a Sikh temple in Wisconsin. He was not being watched by the FBI or any other law enforcement organizations, officials said Monday. "Nobody knew this guy was a threat," Carlson said. Carlson said they were examining ties to white supremacist groups and were continuing to locate family and associates. The Southern Poverty Law Center, which tracks hate groups, called Page a "frustrated neo-Nazi." He was identified by the group as a member of two racist skinhead bands, End Apathy and Definite Hate. Members of the local Sikh community said the president of the congregation and a priest were among the victims. Jagjit Singh Kaleka, the brother of the president of the temple, who was among the six Sikhs killed, said he had no idea what the motive was for the attack. Sunday night and early Monday, police searched an apartment at a duplex in the Cudahy neighborhood near Milwaukee where Page apparently lived. Authorities would not say what evidence they found. The attack came just over two weeks after a gunman killed 12 people at a theater in Aurora, Colorado, where they were watching a screening of new Batman movie "The Dark Knight Rises." Amardeep Kaleka tells TODAY's Matt Lauer that his community is at a "breaking point" after a gunman opened fire and killed his father and five other faithful inside a Sikh temple in Wisconsin. American Sikhs said they have often been singled out for harassment, and occasionally violent attack, since the September 11, 2001 attacks because of their colorful turbans and beards. The 2001 attacks were carried out by Muslims linked to the al-Qaida militant group led by Osama bin Laden. Sikhs are not Muslim but many Americans do not know the difference, members of the Sikh community said. Some witnesses to the Wisconsin shooting said the suspect had a tattoo marking the September 11, 2001 attacks. Authorities confirmed he had tattoos but said they were not sure exactly what the tattoos illustrated. There are 500,000 or more Sikhs in the United States but the community in Wisconsin is small, about 2,500 to 3,000 families, said local Sikhs. The Sikh faith is the fifth-largest in the world, with more than 30 million followers. It includes belief in one God and that the goal of life is to lead an exemplary existence. The temple in Oak Creek was founded in October 1997 and has a congregation of 350 to 400 people. "These people were going to church. Two weeks ago, it was people going to a movie. When is it going to end?" said Ray Zirkle, who came from Racine, Wisconsin with his wife to light votive candles near the site of the shooting. On Sunday evening, hundreds gathered in downtown Milwaukee to hold a vigil of for the victims of the shootings, The Milwaukee Journal Sentinel reported. Participants stood in a circle, prayed and lit candles at the event held at Cathedral Square, and one-by-one people made unscripted statements to the group, according to the newspaper. One man recited "The Lord's Prayer." "This isn't about the city of Oak Creek, we are all responsible," another said, while a third declared: "I'm an atheist and I stand behind every peace loving religion," the newspaper reported. Members of the Sikh community attended the vigil, the Journal reported. "It was same as 9/11," Manpreet Kaur, who attended the vigil with her husband and two daughters, told the newspaper. "My mother-in-law and father-in-law thought that it's not safe for you to go in your turban today." NBC's Pete Williams, Jim Miklaszewski and Andrew Mach and Reuters contributed to this report.